Natalia Valderrama DDS, MS of Ed. "Orthodontic treatment changes a person's life. As the smiles on my patients become healthier and amazing, their self-confidence grows too". That is why Dr. V. loves creating smiles that her patients feel proud and happy of. 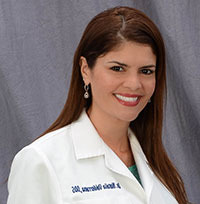 Dr. Valderrama earned two Doctorate of Dental Surgery degrees, one from Eastman Institute for Oral Health at the University of Rochester in New York and the second one from the Saint Thomas University in Columbia where she graduated at the top of her class. She also received from the Saint Thomas University her Master's in Education. She obtained her Orthodontics and Dentofacial Orthopedics Specialist Certification at Jacksonville University's School of Orthodontics in Florida, where she was President of the Class in 2011. Additionally, Dr. Valderrama is a Registered Nurse and holds licenses in three States in the USA. The American Association of Orthodontists recommends that children receive their first Orthodontics consultation at not later than age of 7 years to spot any problems with jaw growth, crowding, crossbites, open bites, protruding teeth, teeth that erupted in the wrong place, gaps between teeth, jaw misalignment and habits such as thumb sucking, tongue trust and speech impairments. Dr. Valderrama offers complimentary consultations for children as young as 4 years old, teenagers and Adults of any age to diagnose and treat all those issues. Dr. Valderrama is a highly recommended Orthodontist who offers the care and commitment her patients have come to appreciate. She will personally work wth you and your family to ensure that her professional expertise aligns with your needs.